Naomi Campbell unimpressed with Kim Kardashian and Kanye West's Vogue cover. During an appearance on Austrailian television program "The Morning Show", supermodel Naomi Campbell was asked to share her thoughts on Kim Kardashian and Kanye West's Vogue Magazine cover. After a short pause, Naomi makes a face and offers "no comment." 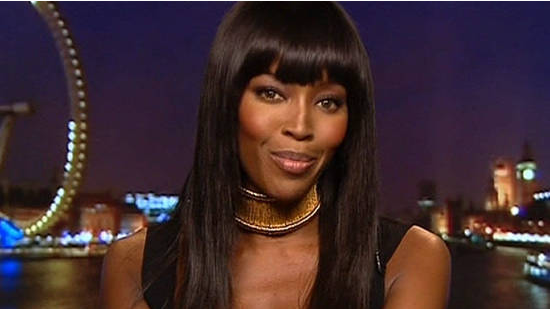 But of course outspoken Naomi goes on to deliver the most polite shade she could muster. LOL - that damn, Naomi!!!!!! Naomi is right, and clearly the devil traded her Prada for a straight jacket. I gotta agree with Wendell Williams from what s/he said a few weeks ago. Like it or not. Kim is a celebrity. By definition meaning she is a public person who is "celebrated", ergo her being on vogue is justifiable. Is she is a despicable celebrity? well that's debateable but regardless she is a celebrity.